Here is how to make a DIY sub-irrigated planter for $12 with a mortar tub, a perforated corrugated drain pipe, and a water bottle. The first two materials can be purchased from Home Depot, Lowe's or Amazon. "The planter is a mortar box. The air and water reservoir is made from three one half round sections of 4" diameter perforated HDPE corrugated drain pipe. There is an overflow drain hole in the side of the box located at the top of the middle pipe. The fill pipe is one recycled PET water bottle with the bottom trimmed off. It fits into a hole cut in one of the drain pipes. Add the soil mix to the box. Tamp it down between the pipe sections to ensure good capillary wicking action." This is the solid Flex-Drain pipe. You need the perforated version. 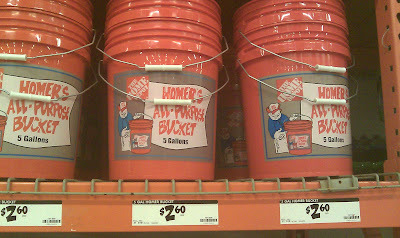 The buckets are available at Home Depot, Ace, Walmart, etc. - For outdoor growing, the granulated fertilizer method advocated by EarthBox is a good choice. This consists of a furrow of fertilizer under the plastic mulch that percolates down over the course of the growing season. 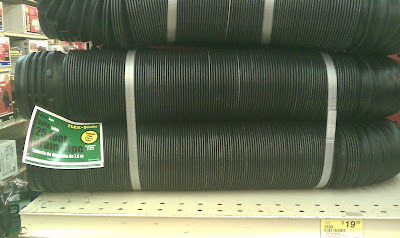 5-gallon bucket at Home Depot.